Forest Adventure is trilling fun for everyone who likes to climb and swing in trees. 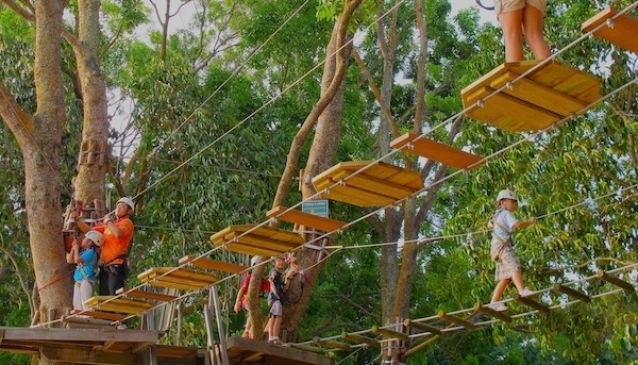 Experience the free flight zipping through the air, gather all your courage jumping from a treetop and fine tune your balancing skills on the exhilarating bridges and obstacles. Enjoy the exciting activity while knowing that you are safely attached at all times. Different courses allow both children and adults to join in the fun. The Grand Course is for adults and teenagers who are at least 1.4m (4ft7') tall. There are 34 different obstacles that include bridges, trapezes, logs, 4 giant zip lines flying over the reservoir and a very exiting and adventures leap of faith nicknamed 'The Tarzan Jump'. All together, calculate about 2.5hrs to complete the entire course. Groups are welcome - expect a brilliant team building session but make sure to book well in advance. The Kids Course is the ultimate experience and adventure for kids - be it with family & friends, for a birthday party or as a school excursion together with their classmates. Fun is guaranteed and adults can relax as the super patient and experienced Forest Adventure instructors take over. The course has 16 crossings and one amazing zip line. Instructors will be with them at specified points but otherwise assist them if needed from the ground only. Allowing them to complete the course on their own will tremendously boast their team spirit and self-confidence. Adults can watch and encourage their kids from the trail below. Recommended for little monkeys between 5 and 10 years of age, measuring at least 1.1m. Forest Adventure is very strict to ensure a maximum of safety. All participants have to wear a helmet and a harness that attaches to the safety lines. Instructors will give a detailed briefing before the start to enable you to complete the course all by yourself and to answer any questions or concerns you might have. They are extremely friendly, helpful and well experienced. For supervision requirements and more safety information, please check the website of Forest Adventure directly. Please check the map to see the exact location and our tips on how best to get there. Forest Adventure is closed on Mondays, except for Public Holidays. Groups of min. 20 children can book on weekdays.